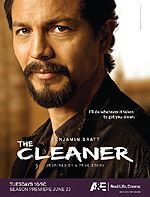 Inspired by the true story of real life "extreme interventionist" Warren Boyd, who also co-executive produces the series, 'The Cleaner' stars Benjamin Bratt as William Banks, a recovering addict who must balance his unwavering dedication to helping others get clean with an increasingly rocky personal life and the ghosts of his addictions. Banks and his teammates Akani Cuesta (Grace Park) and Arnie Swenton (Esteban Powell) employ an unconventional - and often by any means necessary - approach to getting addicts and those who surround them to realize they've reached rock-bottom and help them begin the process of recovery. With every success and failure, William wrestles with his commitment to his work and his love for his wife Melissa (Amy Price-Francis) and their children through an unusual relationship with God. 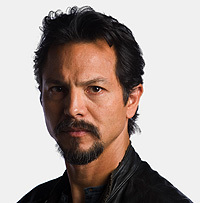 I recently had the opportunity to speak with both Benjamin Bratt and the man the show is modeled on, Warren Boyd, and I first asked Boyd just how many dramatic liberties 'The Cleaner' takes in telling his story? "Well the mechanics of the show are very close to my real life, which sets me back about 13 to 14 years ago. And that's where I was - what you see on the show is where I was about that long ago and in the process and everything that you see." "So it's pretty close and there's a lot of influence in the writers room and with Benjamin. So we keep things as authentic as we possibly can and Ben's really good at doing that." Benjamin, who long did it take to get inside Boyd's persona for the role? "Well, there's a lot of subtlety to who Warren is and what he does. And not a little mystery. I mean as well as I've gotten to know him now through two seasons of doing the show and feeling pressed and just hanging out in general. He's still one of those guys who whether it's cultivated or not and I tend to think that it's not because it's a pretty organic thing. There's an aura of gravitas to him and a little bit of mystery that you can't really penetrate." "And I think that's part of what made him appealing for me to play because I don't have any of that. So, you know, it was nice to put on someone's clothes it you will." The show is obviously fairly grim of a subject matter, but do guest stars like Whoopi Goldberg and Gary Cole get to be funny, perhaps? "I think Whoopi gets to be funny just because she’s a funny lady but, you know, we never lost sight of the fact that she’s also an amazing, dramatic actress and so she comes on with her full skill set and she really did a beautiful job for us." "We’re lucky to have her back as a recurring character as her schedule will allow. She will appear in three episodes this year so that’s good news for us. Gary Cole did a remarkable job in the premiere episode playing a nationally recognizable newscaster who is strung out on speed and in desperate need of help." "He happens to be married to a woman who’s suffering from terminal cancer and he’s spinning out of control. His performance required him to run naked across the beach as well as being, you know, tied down and sedated forcibly and he did it all with a smile and a lot of bravery in his performance. I think people are going to be surprised." But, they do say in the industry when a show starts to bring in guest stars each week that it's heading towards Jumping the Shark. Any thoughts on that?! "Yes, far too early for that. I think what it means in our case is that the writing is top notch and like all good actors you can't really be a - all good actors understand you can't really be good if the writing's not good to start with." I was very surprised that the very first episode of the series didn't concentrate on the tale of how the character of Banks came to be the person that he is today, to show how far down he's gone before being lifted back up with a second chance. Much, indeed, like the DVD cover. At the time was there ever a conversation or discussion about if such an episode should have been made, perhaps? "You know, in the first season towards the end - I believe it was Episode 11 or 12, when (Twenton), one of my team members falls off the rails and starts using Meth again, there were a few little flashbacks of William when he was in the throws of addiction." "That was about as close as we got to sort of imagining what that history was like. That's actually a very good idea and one that hasn't really been discussed yet. But I imagine, as we go forward, you know, the first season and the pilot episode, in particular, is very much an experiment. You know, you have a bunch of great ideas and a bunch of interesting notions about what would make a compelling hour of television." "You throw it all together and you - and then toss it against a wall and hope it all sticks. But I would say by Episode 10 or 12 of last year we had a pretty good idea of what was working and what was not and, thus, the restructuring that I spoke about." So we'll take that key. We'll take that note. That's something to discuss. Actually, it's kind of interesting to me because it would be fun to play, certainly. I probably have to shave, which my wife wouldn't like, but all in sake of the art!" Yes, it's funny you should mention the shaving. Let's be honest, that goatee has got a life of its own, doesn't it? "Yes, I'm having a couple of tenants in there, yes," he laughs loudly. "No, you know what's interesting about that is, you know, it actually became a lively discussion between myself and the powers that be as to whether or not I as an actor should wear a beard." "And one of my arguments was that in recognition of - and this is not a scientific fact, but I call it a fact nonetheless, that most addicts I know, most people in recovery I know, including Warren Boyd here sitting next to me have facial hair." "And if we allow the drug addiction or drug abuse on some level is a masking of emotions or deep seeded pain, then I would argue that in the face of recovery the need to mask continues and we do it in other forms. And I think the facial hair - I'm using it anyway as a part of my character makeup as something to hide behind." As we know from the end of season one, your character's struggles with his own demons are far from over. Can you discuss any possible temptation that might come his way during the second season? "Well, I think it's, you know, I think it's important to remember and this is fact and I think that Warren would substantiate this, is that once an addict, always an addict." Warren, do you ever take any of those stories and maybe incorporate them into the show or give them to the writers or even tell the writers about them? "In terms of taking someone's story, you know, who reaches into us, you know, because of the show, I don't really feel too comfortable doing anything like that. However, in my past 18 years I have taken bits and pieces from stories and from cases that I've been involved in and put them into episodes as far as the mechanics and the real aspects of those episodes." "And what we're trying to do now is put together a database so that people who want to reach in because we're really getting a lot of it. When people want to reach in and be able to have a database that they can go to and really try to get us to help them with placement and, you know, counseling and things like that." How challenging is it to be able to play a real life person; someone as honestly fallible, as flawed, and yet as heroic as Warren Boyd? "Thanks for asking that. It's a first for me and it makes it a joy to come to work in all honestly. I've had a lot of great television gigs, but none that comes close to this in terms of its complexity and enjoyment level because he's drawn from a real person because the person I'm portraying on television is so complex and often times grouchy, I'll just be straight up." "You know, he's got - I kid him he's like the candy bar with that crunchy outer, you know, outer shell with a gooey center in the middle. You know his makeup is compelling to me because again if you saw Warren in person and his persona, you know, the cover belies the inside on some level because, you know, he would argue against this." "But I think what he does in his real job and not to say that his, you know, executive producing abilities on the show is not a real job. But what he's really exceptional at which is helping people comes from a truly earnest and organic place and that to me makes him beautiful." "And when you combine that soft center if you will with an exterior that's been in part hammered by the school of hard knocks that makes for a really pretty interesting character to play and to know." It seems you do some strong work in dramas such as this and 'Law & Order' "Absolutely, I mean I’m a proud alumnus of 'Law and Order,' a show which is as you all know, has just been picked up for its 20 season, which is a remarkable record and is a good show. But what I did as an actor on that show was really sort of as an expositional tool." "The difference here and the difference is extreme, for as much as I loved that job, what I’m afforded the time and place to do on this show is to create a three dimensional character who has the complexity and dimension of someone from real life because it’s based on someone from real life." "And so while you have at the center of our story, William Banks, a man who was chosen as his location, the job of saving lives, which by all consideration, is a heroic feat. You have someone who is deeply, personally flawed, who in the balance of succeeding at work, fails miserably as a husband and often times as a father." "And to me, I just thought that was an interesting tension to play against and one that, you know, I sometimes can relate to as an actor who works out of town." 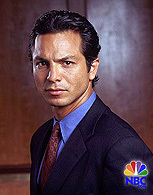 Also, while you were starring in 'Law & Order' you actually appeared in four of NBC's The More You Know public service announcements - on topics such as reading, and other Cleaner-ish ones like substance abuse, family communication and violence prevention. Perhaps you were destined for this role? "You certainly have done your homework haven't you? Well, there's never ever anything, you know, predetermined. I guess I’m a do-gooder at heart, man. What can I say?"